Will The Punisher still have a place on Netflix in the future, in the time following the streamer's hack-and-slashing that came in late 2018? Lead actor Jon Bernthal sure hopes so, but he isn't losing sleep wondering about what-ifs. Speaking with Collider during an interview alongside his co-star Giorgia Whigham, who plays the troubled but tough teen Amy Bendix on the superhero show, Bernthal got to talking about where he predicts The Punisher is headed now that it dropped its second season on Netflix on Friday, January 18 — and how he would feel if the recent collection of episodes wound up marking his final appearance as Frank Castle and the last installment of the series. When asked if he hopes The Punisher gets a third season and about his feelings regarding the possibility of it getting cancelled before that could happen, Bernthal offered a candid, admirably level-headed response. Essentially, for Bernthal, what shall be simply shall be — and there's nothing more to it. "Yeah, it's gonna be what it's gonna be. I get it. You know what I know. Part of the deal with this profession is that you can make a choice and worry about the s*** that you can't control, or you can worry about the s*** that you can. For me, all I've ever cared about with this project is that I want it to be as good as it can, and I'll fight to make it as good as I can," the actor said. He continued, explaining that he feels there's very little sense in him focusing on what he wants to happen. 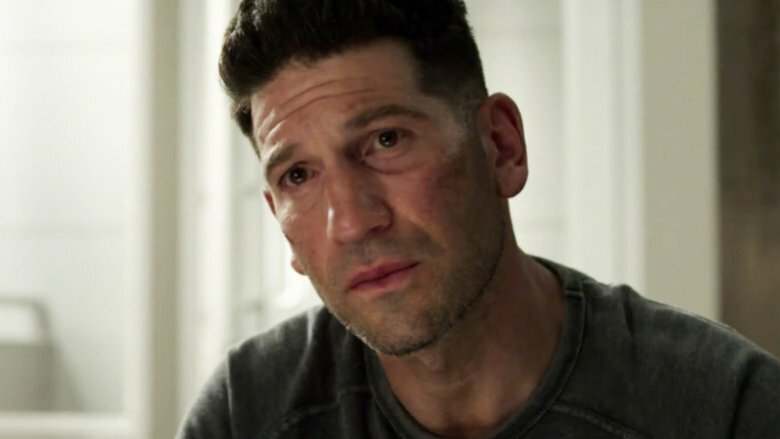 Instead, Bernthal would rather focus his attention on readying himself for a kickass third turn on Netflix if the streamer does ultimately green-light another season. "It's not whether we get the chance [to do another season] or not. For me, to put energy into saying that I want it to be this or I want it to be that, that makes no sense. But if we're doing it, you better believe that I'm gonna put all of my energy into making it good," Bernthal shared. "I like to focus on things I can control, and I certainly cannot control that." The actor's remarks here serve as both a gust of fresh air and a comforting hug for fans of The Punisher. Bernthal doesn't appear worried that Netflix is going to sharpen its ax and start swinging at the last two remaining Marvel series on its roster (The Punisher, obviously, and the Krysten Ritter-starrer Jessica Jones), which signals that viewers shouldn't stress either. Additionally, it's great to hear an actor maintain his cool during time that otherwise feels incredibly tense. When Netflix pulled the plug on Iron Fist, Luke Cage, and Daredevil in rapid succession without a whole lot of explanation, people panicked. Fans cried out on social media, lodged complaints to Netflix and Marvel brass alike, and even started online campaigns calling for the streaming platform to reconsider its decision. That Bernthal is keeping calm amid the chaos is refreshing and reassuring. Like Bernthal is funneling his energy into the things he can control rather than what he can't, so too should Punisher enthusiasts. The second season of the series is hot out of the oven and ready for bingeing as you read this, and there's loads to look forward to in the new episodes. Elsewhere in his chat with Collider, Bernthal teased some brutal fight sequences ahead. As he tries to protect Amy from the baddies who are after her blood, Bernthal's Frank finds himself in the crosshairs of some pretty gnarly guys — but the beatdowns he doles out aren't as personal as they were in the first season of The Punisher, making them all the more intriguing to watch and more interesting for the actors to film. "Some of the fighting that happens this season, unlike any of the other times with Frank, it's not personal. It's just that these are bad guys, and I'm trying to look after and protect this young woman that I don't know. It's not like these are the people that killed my kids, but some of it is quite personal," explained Bernthal. "Eric Linden is the stunt coordinator. He was my double from Daredevil. We started this whole thing with Frank and the way he fights together, and I love him. I couldn't be happier that he's running the show now, as far as stunts, and I can't wait for people to see what he does. We definitely took it up a notch, this year … the bar fight, at the beginning, I injured myself doing. I broke my hand and that threw things back. We really couldn't fight until the end, so they all stacked up. We shot all of the fights in the last month of the show." Whigham added that she had a blast shooting the bar fight scene as well, even though her character wasn't directly involved in the punch-throwing and face-smacking. "That was a cool fight for me, too, 'cause I kinda just watched it. I was in the corner, cowering and all scared. Any opportunity I got to watch a fight scene go down, I was there for it, even if I wasn't in it," she said. "For a lot of the bar fight scene, I was behind the monitor like, 'What's gonna happen?' So, being there in that little bathroom, but not having to necessarily learn choreography, like Jon did, was exciting. It was really cool." No matter what happens to The Punisher from here — whether Netflix clips its wings and sends it to the show cemetery where Iron Fist, Luke Cage, and Daredevil are buried, or whether the streamer renews it for a dozen more seasons — at least fans have one brand-new season of action-packed awesomeness to devour and another one to re-watch as many times as their little hearts desire. Catch the complete second season of The Punisher, which also stars Ben Barnes as Billy Russo, Ebon Moss-Bachrach as David Lieberman, Deborah Ann Woll as Karen Page, and Amber Rose Revah as Dinah Madani, on Netflix now.